A few years ago I became intrigued by the short write up and (the) profile of this little known Russian glider in Martin Simons’ publication “Vintage Sailplanes 1908 – 1945” . 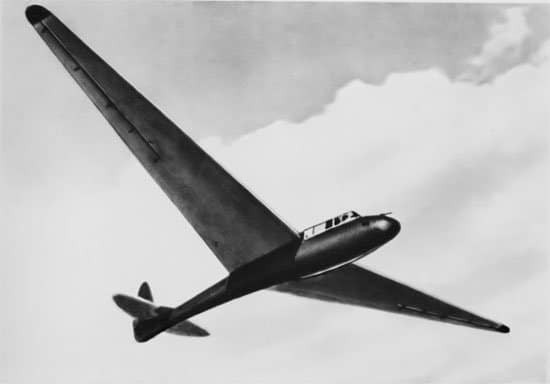 This two seat glider from 1936 is believed to be the first high performance sailplane (unless you know otherwise) to employ a forward swept wing, which allowed the rear pilot to sit over the centre of gravity of the glider, meaning that no trim change was necessary for various weights of passenger and gave the added advantage of a clear view forwards and upwards for both occupants, which can be critical in a steeply banked turn in thermals. The early three view had some errors but these were subsequently revised in Martin’s later publication “Sailplanes 1920-1945” which is still in print. So here I have produced with the help of Martin’s work and further searches through Russian books provided and assisted by K. Matthew Victor, as much information as I have been able to put together, including some rare pictures. 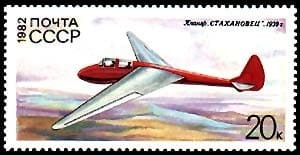 The KIM-3 is better known as the two-seater “Stakhanovets”, with which the world distance record for multi-place gliders was made by pilots Kartachev and Savtov, soaring 619 km from Moscow to Ouchnia on July 22nd 1936. 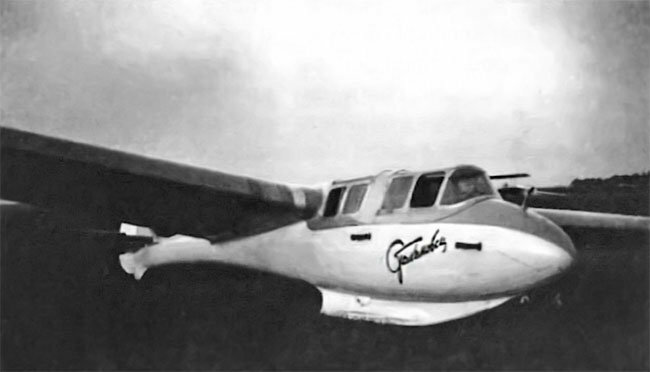 The Stakhanovets was a two seat performance glider designed by Viktor Emelyanov. It was a development of his earlier 2 seat glider the KIM-2 by primarily extending the nose plus an extra meter on the wingspan to add the downturned tips. It was constructed at Moscow Glider Works in 1936. The most notable feature of this high performance sailplane was the pronounced sweep forward of its wings, which allowed perfect visibility for both pilots, something that cannot be claimed for any other two-seater of that time. Straight dihedral was used with the final wing tip deflected downward to prevent tip and aileron damage on landing and take off. 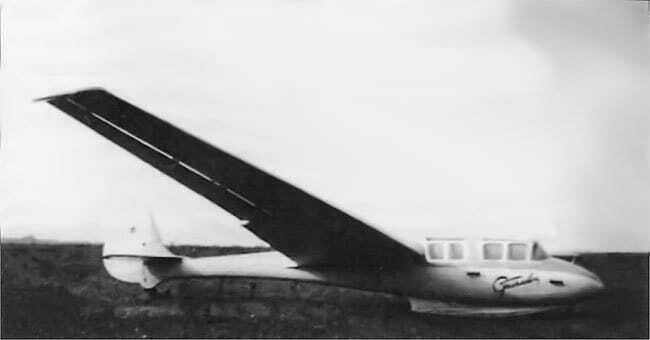 The glider wing was of monospar construction design with a trapezoid planform using a large taper to the swept forward wing utilising Slotted ailerons. The cockpit was equipped with dual control and enclosed with a celluloid panelled canopy with sliding windows. It was also equipped for night and instrument flights, the lights working from storage batteries, which also powered a radio receiver and loudspeaker. The Seats were adjustable and behind the second pilot there was a luggage compartment for 10 – 15 kg of baggage. The landing skid was a rigid ski box without any springing. The sailplane was stressed for aero towing and flight in rough air conditions and was equipped with a standard type of lock for Aerotowing. Only one was ever built. For the air test the “Stakhanovite”, piloted by Viktor Lichenko and was towed up by a P5 to five hundred meters above the Tushino airfield. On board was the designer Viktor Emelyanov. Lichenko made a few turns to the left and to the right, increasing in steepness and finally exited and went into a loop. The load increases and can be seen in the bent long yellow wings. We check each other, and everything must be in order. And yet? Crack! At the moment of greatest load is heard sharp crack. The glider, which was built on glued strips of pine and plywood and covered with a cloth, strained almost to the limit. The loading decreases and now the glider is inverted. We pass from a state of near-weightlessness, into a dive. Wings behave normally. No vibrations. Only when exiting dive again is heard crackles. The individual minor design details, do not carry heavy loads, but receive more deformation under loading the entire wing, particularly in glued areas. We repeat the loop again and Llchenko is satisfied as the “stitched” glider no longer emits crackles, no sounds except the powerful hiss or whistle in times of increasing speed. It perfectly obeys the rudders. To celebrate Llchenko does a steep climbing turn. 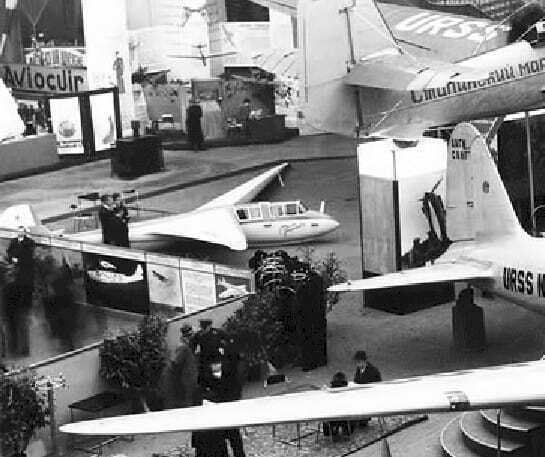 In November, 1936 the Stakhanovets was exhibited in the Soviet section of the 15th International Aviation Exhibition in Paris. 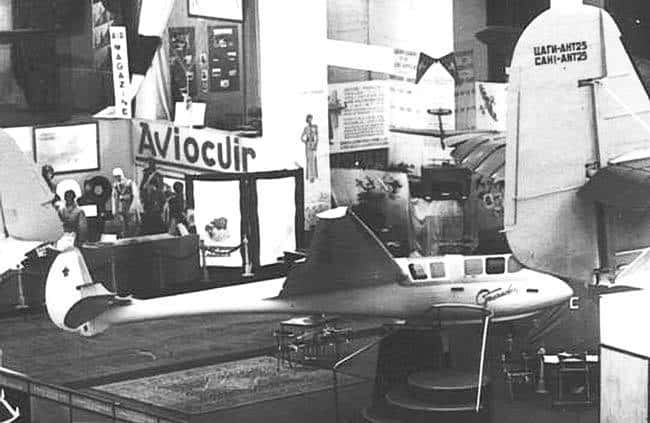 After the Salon Aviation exhibition, a demonstration flight of the glider was arranged. The demonstration took place on 4 December, but after a successful tow, the glider was partially damaged during landing by the Russian pilot ILlchenko. In 1937 the KIM 3, was repaired and could resume flights, but the pilots noticed a detrimental lack of manoeuvrability when close to the ground. The Stakenhovets was soon after to finally be damaged beyond repair. CAGI R111 (15%) – mid pt. The swept forward planform had another advantage. On any tapered wing the tip sections naturally tend to stall earlier than the roots. The practice in Germany was to twist the wings progressively to lower angles of incidence towards the tips, in order to retain control. Unfortunately this feature was a disadvantage at high speeds. The tips would quickly reach zero angle of attack relative to the local airflow and any further increase in airspeed would see them actually beginning to flex downward, throwing more load onto the inner parts of the wing, creating great drag. Sweep forward has the effect of delaying tip stalling and so the Stakhanovets needed no geometric wing twist at all, even though it had a very strongly tapered planform. In theory its glide ratio at high speeds would therefore be very good. The only disadvantages of such a shape were that it tended to complicate stressing and construction. To avoid the constructional problems as far as possible, on the Stakhanovets all the nose ribs were glued to the spar at right angles. When covered with plywood to form the usual ‘D’ – nose, they did not create any appreciable drag by being set at an angle to the direction of the flight. Aft of the spar, the ribs for the fabric covered portion of the wing were aligned parallel to the aircraft’s centre line, which, because of the sweep, required them to be set at a slight angle to the spar. The wing root fittings also needed extra work. Otherwise Emilyanov’s wing was simple in structure and proved extremely efficient. The Stakhanovets must have been difficult to land in small spaces, although spoilers were fitted on the upper surface of the wings, they proved ineffective, pilots reporting that they made hardly any difference when opened. There is little doubt that the Stakhanovets was in terms of gliding performance, better than the German Kranich. It had a larger span, higher aspect ratio and was at least equally clean aerodynamically. It had the additional advantage of a good high speed performance because of the untwisted wing. The Stakhanovets broke and re-broke all the important two-seat records.